Inside the Living/Learning Center Gallery at the University of Vermont is an arresting sight. Paired beige and brown figurines, averaging a foot tall, appear to march and dance their way toward the entry. Some are recognizably human or animal; others look mythological, with three heads or legs. The figures are not really moving, of course, but each pair is frozen in a moment of interaction or movement. All 40 or so are arranged on three rectangular pedestals that diminish in height as they approach the door. Above them, three more figures — or at least their heads — pop directly from the back wall, suggesting that the scene stretches beyond the confines of this small, windowless gallery. If there were a soundtrack to the show, one imagines a cacophonous din — something like the sound of, well, life itself. Parades are already part of Vermont’s living fabric — think of Shelburne Museum’s 500-foot-long display of circus figurines, the pageants devised by Bread and Puppet Theater in Glover, and Warren’s eclectic Fourth of July parade. Van Fleet and Moss’ parade, however, doesn’t limit itself to human activity, or even to human time. “Parade” considers planetary time, Earth’s existence over eons — a long view that makes the installation fundamentally about the environment. Hence, for instance, her chimerical sculpture with the posture of the Winged Victory of Samothrace, the head of a bighorn sheep and an anchoring third leg. Some of Van Fleet’s figures express that morality more overtly. “Our food is gone someone ate it,” reads a message written in caps on a small blackboard screwed to one figure’s rectangular body. “We live you die we eat you starve,” reads another. Each of these figures’ pairs of “arms” are formed by a discarded fork and spoon. “A huge amount of space on the planet is now given over to growing food for humans,” explains Van Fleet, and mentions an article she recently read in a favorite publication, New Scientist, about how China is buying up land in Africa to grow food for its own people. But most of Van Fleet’s sculptures don’t have messages inscribed on them. For her, they are vessels of history, assembled to create “a dialogue between the human and nonhuman,” as she puts it. She creates her figures, like most of her art, from found or recycled objects. “Things kind of jump into my hands,” she says. Rather than altering their shapes, Van Fleet leaves the fragments’ “histories intact” and manipulates the attitude, motion or emotion they already express. 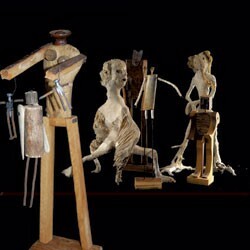 Two of her stick-like human figures, who appear to be chatting, have driftwood heads — one elephant-like, the other robotic-looking — that are as expressive as Moss’ swirling forms simply by virtue of how they’re attached. Five ingenious beetles and insects in the show are made from naturally round stones with objects such as metal tongs for pincers. The beetles are placed as if emerging from a shadow cast by a pedestal — an instance of the humor Van Fleet uses to balance her occasional didacticism. Playfulness has been a key to her work at least since her delightful stop-action video “March of the Tea Pots” (2002; viewable on YouTube) — one of several parades Van Fleet has created over her career. The pairings in this “Parade” create mini-narratives that amuse as well as startle and confound; in one, Van Fleet’s figure holds out a childlike bundle, and Moss’ appears positioned to catch it. It’s no surprise that the two have collaborated before. They first got to know each other’s work in Japan in 2009 as two of four Vermont artists showing in an exhibit related to the UN Convention on Biological Diversity in Nagoya. Having seen each other’s figures in separate shows at the 350 Vermont Climate Change Exhibit in Montpelier last summer and elsewhere, the artists searched for months for a way to show the works together. The Living/Learning Gallery, Moss says, allowed them the latitude to experiment on-site.